After a light breakfast we rented some bicycles for 50 Baht and started a crazy ride through Ayutthaya. There seem to be no rules on the streets but after a few minutes on the bike you feel like a cogwheel in a machine. I made some jokes about the streets and a few minutes later a had a nail in one of my wheels. And where? At the other side of the city. But after a few minutes we found a small garage where the owner fixed my wheel like he das to do it everyday twice . But form then everything worked out fine and we could visit all the temples on our long list. The most impressive temple was Wat Chaiwatthanaram. 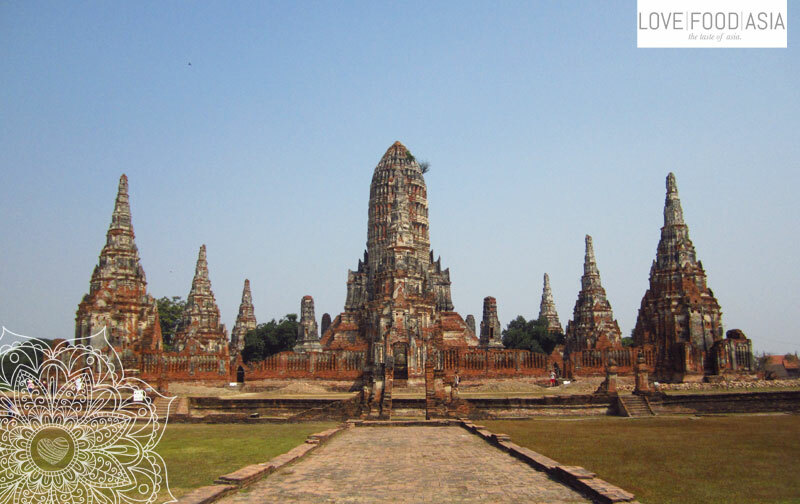 40 years ago this temple was found in the jungle again and now it is the most visited temple of Ayutthaya. It is fun to visit all the temples by bike and I can highly recommend it. Get a full map of all temples here! At night we planed to leave Ayutthaya in direction Bangkok to organize our Visa for Myanmar.